Sharing without Reckoning is the first full-scale treatment of the ancient and persistent distinction between “perfect” and “imperfect” rights and duties. 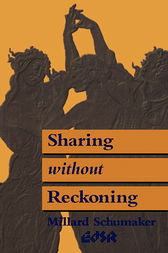 It examines the use of the distinction in jurisprudential, philosophical and religious material from Classical times until the present; proposes a connection between imperfect right and the “norms of reciprocity” (as that complex set of ideas has been developed in anthropology and sociology); and argues that contemporary understanding of the nature of morality and of moral reasoning would be well served by the reintroduction of this traditional doctrine. This enlightening study includes a notable chapter reassessing the role of imperfect obligation in the thought of Immanuel Kant, portraying a “kinder and gentler” Kant. Concluding by elaborating ways in which concepts such as love, justice and the boundary between law and morality might be reconstructed — taking the fact of imperfect right seriously — this work will serve as a key reference for scholars interested in the complex question of “perfect” and “imperfect” rights and duties.